Need Help Saving Your Marriage? I’ll help you build a plan that’s tailored specifically to your unique situation. There are only 4 coaching slots remaining. 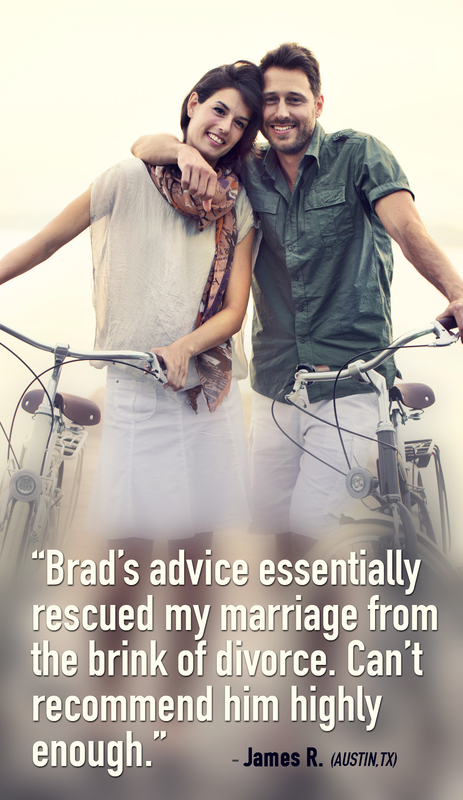 Many people can apply the strategies outlined in my Mend the Marriage program word for word. Sometimes, though, you may face a unique situation that can’t be resolved with generic advice or inflexible strategies. Think You’ll Be Fine? Going It Alone Can Be Dangerous! If you’re faced with this kind of unusual or confusing scenario, things can quickly spin out of control and begin to feel hopeless. Unless you can quickly adapt your strategy to suit the situation, you may get caught off guard and unknowingly make a mistake that could permanently ruin your chances of ever saving your marriage. Let me put it this way: if you’re not a mechanic and know absolutely nothing about cars, would you try to fix the engine in your brand new BMW? Of course not! There’s a good chance you’d just end up doing more damage. If you’re sensible, you won’t take the risk… you’ll hire a reputable, trained mechanic to repair the car properly. So, if you wouldn’t trust yourself to perform complicated car repairs, why would you trust yourself to fix your complicated relationship problems? I don’t know a damned thing about repairing your new BMW… but I do know how to fix your broken relationship. I’ve read all the relationship psychology textbooks, and I’ve combed through the research studies. Over the past ten years, I’ve helped thousands of people around the world get a second chance at a happy, healthy marriage. I’ve seen first-hand what works and what doesn’t. And, most importantly, I’ve learned how to adapt the proven strategies in my program to suit almost every scenario. Whatever your partner may throw at you, I’m just an email away, and we’ll tackle it together. I’m looking forward to chatting with you soon! 1.) Scroll to the bottom of this page and click the yellow “sign up now” button. You’ll be taken to a PayPal order form. 2.) You’ll be taken to a secure PayPal order form. Enter your billing details and complete your order. 3.) After completing your PayPal transaction, fill out a brief form to provide details of your situation. If you keep your emails brief, I can usually respond in 24-48 hours. I guarantee a reply within 72 hours. In the unlikely event I do not reply to your message within 72 hours, I will extend your coaching subscription by one week for free. All email correspondence is strictly confidential. I will never sell or disclose your personal information. There are no refunds. However, you may cancel your subscription at any time and continue to receive coaching for 30 days after your last payment. To cancel, simply send me an email or fill out the cancellation request form. All payments are processed by PayPal.com using secure encryption technology. Your credit card statement will show a charge from “BBCOACHING”. Yes! I want to sign up for Brad Browning’s 1-on-1 email coaching service. I understand this is a monthly subscription service, and that I will be re-billed monthly until I decide to cancel. I understand that I can cancel via my PayPal account or by sending Brad an email.